Brand New Luxury Home in Inlet Beach with Gulf Views! ENJOY FREE BEACH SET UP WITH THIS PROPERTY. Family Tides located in The Heron at Inlet Beach is a newly constructed 3-story luxury home, designed to comfortably entertain gatherings. 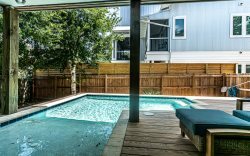 This spacious home with over 2,500 square feet of living space and 695 square feet of balcony space offers four bedrooms (3 with king beds) and four bathrooms. Samsung 4K HD with HDR TV’s are throughout the home with a Seura Outdoor TV on the third floor balcony. SONOS provides music on the first level, second level master and third level bedroom, bonus room and balcony. To add to the charm in the living room is a fireplace. You are steps away from the Emerald Coast with its sugar sand beaches. . A short walk or bike ride to restaurants and shops of Rosemary Beach, less than 15 minutes to Pier Park shopping and entertainment, walking distance to the brand new 30 Avenue Shopping Center. Inlet Beach is less populated area allowing you to enjoy the serenity along the 30A corridor. Need a break from the beach…enjoy a dip in our community pool of only eight homes. The first level open floor plan offers a living area complete with a fireplace, state of the art audio/visual including SONOS. The Chef’s kitchen is wonderful for preparing a meal or a simple cup of coffee with Fisher Paykel appliances which includes a gas cooktop. Other kitchen features are quartz countertops, farmhouse sink, and icemaker and is fully stocked to meet your need. Two highchairs are also available in the walk-in pantry. The bedroom on this level has a king bed, flat screen TV, reading corner, beautiful hardwood floors and its own en suite with a large shower. On the second level you will find the master suite or should we say retreat! The spacious bedroom has a king bed, sitting area for relaxing with two chairs, a large flat screen TV, SONOS, hardwood floors. The en suite spa like bathroom has marble flooring, oversized shower, vessel tub, and double vanity. Just outside the master bedroom is a large private balcony with two chaise lounges and two chairs for enjoying some quiet time. The bunkroom is perfect with two sets of twin bunks each with their own USB charge outlet. Ample storage, flat screen TV, en suite with double vanities and a balcony overlooking the pool area. Entering the third level to your left is the fourth bedroom with a king bed, flat screen TV, SONOS, sitting area, hardwood floors, en suite with an oversized shower and double vanity and a balcony overlooking the pool area. The bonus room is a great place for family and friends with its large 75” flat screen TV, Surround Sound, SONOS, DVD, bar area with refrigerator, 80’s Style Arcade Game and ample seating for a movie or game night. One last area, the third floor balcony is equipped with an outdoor 5 burner grill, Seura Outdoor TV, Apple TV, SONOS. The outdoor counter height dining table for eight is on one end of the balcony while the other is complete with a sofa, loveseat, coffee table and yes, gulf views. With all of this, you are still only a short stroll or bike ride away from Rosemary Beach, Seacrest Beach or 30 Avenue with an array of dining and shopping options. We hope you enjoy your time and make great memories here at Family Tides. Stay at “Family Tides” for the perfect vacation! 4) CONSTRUCTION IS IN PLACE ALL OVER 30A. We cannot be held responsible for construction near the home. There is currently construction next door where a new home is almost completely built. 1 Beach Chair set up is provided, the chairs will be set up just to the left of the Wall st Beach access directly south of the home. CHECK IN: 4:00 P. M.